Goldblue Black&White Base Ceramic flowing glaze planter pot made of ceramic materials perfect for holding succulent or cactus plants. All plant pots are made of top-quality clay and baked in high temperatures,. Beautifully glazed with elegant, Ice crack zisha design, suitable for decorative gardening,desk,bookshelf,dinning table,living room,hosting room and everywhere. 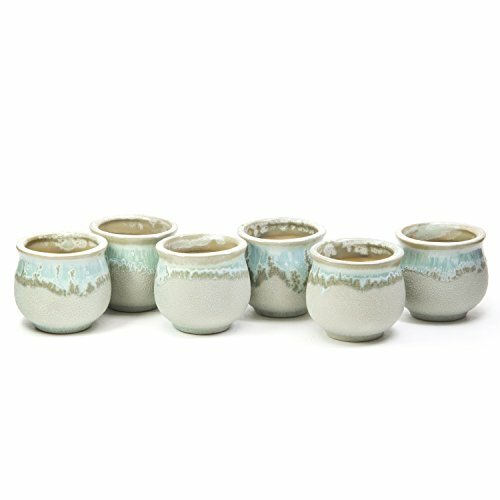 Ideal for adding a dash of refreshingly modern design to your home,Great Gift - this ceramic pot can serve a variety of purposes. Aprroximate Size:2.5Inchx2.3Inch (L x W).There is a small hole in the bottom that the water can flow through it. If you have any questions about this product by goldblue, contact us by completing and submitting the form below. If you are looking for a specif part number, please include it with your message.